September 22 is a holiday for all of you chocoholics out there. It is the National White Chocolate Day. Properly speaking, white chocolate is not a type of chocolate but rather a chocolate derivative. It does not contain cocoa solids which are the primary constituent of chocolate. However, white chocolate does contain an ingredient extracted from the cocoa bean – cocoa butter. White chocolate is typically made of cocoa butter, milk, and sugar. As it doesn't contain dark-colored cocoa solids, it is ivory or pale yellow and not brown. White chocolate lacks many characterizing ingredients of chocolate, such as theobromine, caffeine, riboflavin, and thiamine. The first white chocolate bar was produced in Switzerland by Nestlé in 1930s. In the United States, the production of white chocolate was launched in 1945. 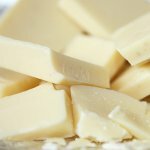 According to U.S. standards, white chocolate must contain at least 20% cocoa butter, 14% total milk solids, and 3.5% milk fat. The content of sugar must be no more than 55%. To celebrate the National White Chocolate Day, make a fondue. In a bain-marie, combine 11 ounce chopped white chocolate and 1/4 cup milk. Stir until melted. Pour the chocolate mixture into a fondue pot and dip fresh fruit slices in it.